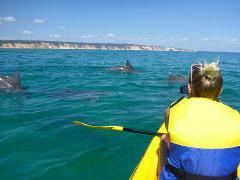 Experience an Adventure back to nature & into the wild with our Noosa Dolphin View Kayak Tour. Feel the thrill of a stunning 4X4 adventure along the spectacular Teewah Beach from Noosa’s North Shore, deep into the Great Sandy National Park. 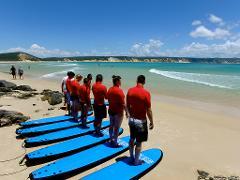 Learn to surf on Australia’s longest, safest, wave Double Island Point. 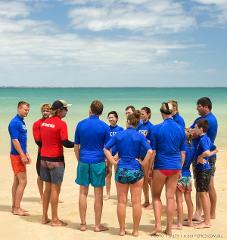 With our expert guidance you could be surfing waves 100's of meters long first surf lesson! Escape the crowds to Double Island Point only accessible by 4WD vehicles. Relax, explore or experience the easiest, longest wave in Australia - Double Island Point. 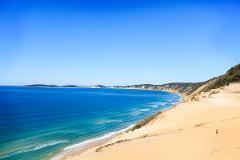 No crowds, only accessible by 4WD vehicle's along Great Beach Drive it's a life time experience. See the buzzing wildlife in a paradise location. 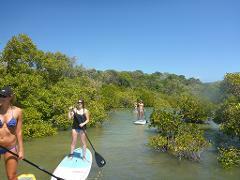 Try one of the worlds fastest & most popular new sports, Stand Up Paddle! Our many wind protected flat water locations are ideal for learning or for cruising the bays on our day eco tour. Great Beach Drive included into the National Park. Try one of the worlds fastest and most popular new sports, Stand Up Paddle! Our many wind protected flat water locations are ideal for learning or for cruising the bays on our local eco tours. Try one of the worlds fastest & most popular new sports, Stand Up Paddle! 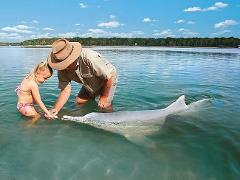 Double Island Point has many crystal clear pools and lagoons ideal for learning. A super long beginner right hand wave is a fun challenge for the more adventurous. This amazing tour takes you on a high tide along the flat waters of Pelican Bay protected from the winds and waves of the open beaches. 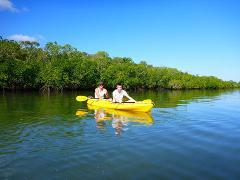 Paddle along the mangrove ecosystem home to a large number of turtles & many other marine life. 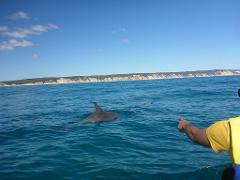 Experience the rare opportunity to interact with wild Australian Humpback dolphins. A stunning beach drive into the Great Sandy National Park to the spectacular Double Island Point, only accessible by 4wd. 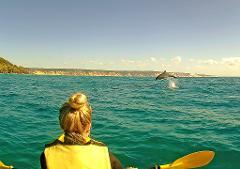 View the highly active local marine life in a unique kayaking adventure. Learn to Surf Australia's longest wave! Learn to surf on Australia’s longest, safest, beginner wave. This is the most stunning location you could dream of having your first surf lesson. Escape the crowds to Double Island Point only accessible by 4wd. Dolphins live here too! Learn to surf on Australia’s longest, safest, beginner wave in the most stunning location you could dream of having your first surf lesson. Escape the crowds to Double Island Point only accessible by 4wd. Dolphins live here too! Experience the easiest, longest wave in Australia - Double Island Point. 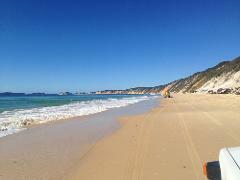 No crowds, only accessible by 4wd along the beach this place is a once in a life time experience. Ride waves 100's of meters long even as a beginner! 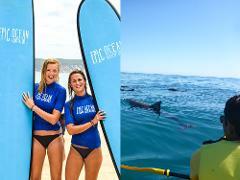 Feel the thrill of a unique Great Beach Drive transportation from Noosa to Rainbow Beach with a dolphin view kayak tour along the way.This exhilarating experience cuts out highway driving & long bus rides taking you into the National Park. Feel the thrill of a unique Great Beach Drive transportation from Noosa to Rainbow Beach with a Double Island stand up paddle lesson on the way. This exhilarating experience cuts out the highway driving and long bus rides on an epic tour. 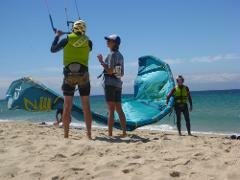 Get to try what all the buzz is about with one of the worlds fastest growing sports Kitesurfing! In this fun packed hour we get you having a blast on stunt kites. 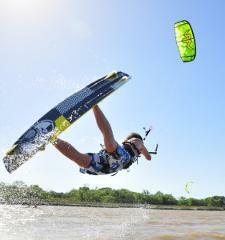 This gives a great intro into the craze of kitesurfing. 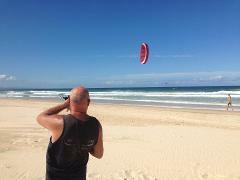 Learn to kitesurf in the crystal clear, warm waters of one of Queensland's pristine coastal locations. Frequent ideal conditions, flat water & wide open beaches make kitesurfing progression not only fast with us but also very safe! Feel the thrill of a unique Great Beach Drive transportation from Rainbow Beach to Noosa with a dolphin view kayak tour along the way.This exhilarating experience cuts out highway driving & long bus rides taking you into the National Park. Feel the thrill of a unique Great Beach Drive transportation from Rainbow Beach to Noosa with a Double Island learn to surf lesson on the way. This exhilarating experience cuts out the highway driving and long bus rides on an epic tour. Feel the thrill of a unique Great Beach Drive transportation from Rainbow Beach to Noosa with a Double Island stand up paddle lesson on the way. This exhilarating experience cuts out the highway driving and long bus rides on an epic tour. Feel the thrill of the ultimate National Park 4X4 adventure with your family & friends on a private personilised day out. 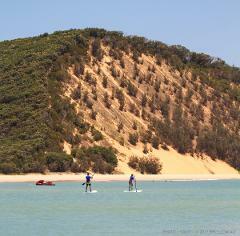 Double Island Point at Rainbow Beach is an aquatic paradise buzzing with wildlife & a truly breathtaking experience. Experience Australia's most unique and rewarding wildlife and aquatic tours at Sunshine Coast's best kept secret off road location. 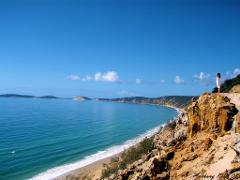 Double Island adventure filled 2 night package at the naturally beautiful Rainbow Beach. Experience Australia's most unique & rewarding wildlife & aquatic tours in Sunshine Coast's best kept secret off road locations. 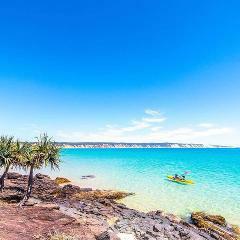 A kayaking adventure at the spectacular Double Island & a 1 day tour on world heritage Fraser Island (K'gari).